No one really knows what consoles Assassin’s Creed is coming out on. Everyone originally believed the game to be an exclusive for the PS3. 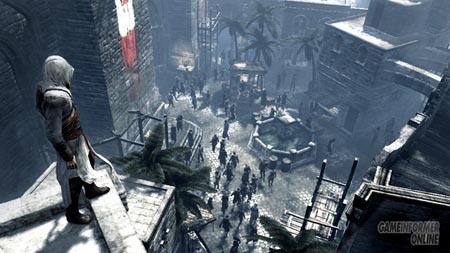 Then it seemed that Ubisoft had a version of the game on the 360 playable at E3. Now the plot thickens with a statement from Ubisoft that does nothing but to confuse everyone more. The guy’s at SPOnG (hear me out!) asked Ubisoft what the real deal was with Assassin’s Creed, and they answered with a rather cryptic, “Assassin’s Creed is coming to the PS3. No other announcements have been made.” First off I would like to say that I personally believe Assassin’s Creed coming to the Wii is a big stretch. Then again, I could (and would like to be) wrong. We reported on a leaked memo from Ubisoft that stated Assassin’s Creed would be coming to the Wii, along with PC, 360, and PSP. Perhaps that leaked memo is slowly gaining credit. Thanks to 4th reich for the heads up!